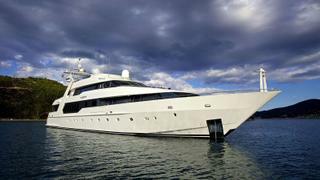 The 44 metre motor yacht O’Leanna, listed for sale at SSH Maritime, has been sold in an in-house deal. Built in aluminium by Swedish yard Marinteknik to a design by Mulder Design, O’Leanna was delivered in 1994 and refitted in 2016 when she received a new interior by Askdeco. Accommodation is for 12 guests in six cabins comprising two master suites, two VIP suites and two twins, all with entertainment centres, Samsung LCD television screens and en suite bathroom facilities. A further five twin cabins sleep 10 crew. The main deck saloon has wooden floors, an L-shaped settee to port with armchairs and an entertainment centre to starboard including a 39 inch Panasonic television screen. Forward is a dining area with seating for 12 guests. The sky lounge is dedicated to pure relaxation, with comfortable seating, coffee tables and a bar while the aft deck on this level has two tables and directors’ chairs for al fresco dining under the moonlight or a dip in the Jacuzzi tub. More outdoor dining is available on the main aft deck with seating for 10 guests in upholstered teak freestanding chairs. Further features include an underwater observation lounge and a dedicated massage room. Twin 2,506hp MTU diesel engines linked to KaMeWa water jets give her a range of 1,100 nautical miles at 15 knots and she is fitted with Trac zero speed stabilisers.